Yesterday I shared a post showing My Favorite Things stencils and some various ways to use them. 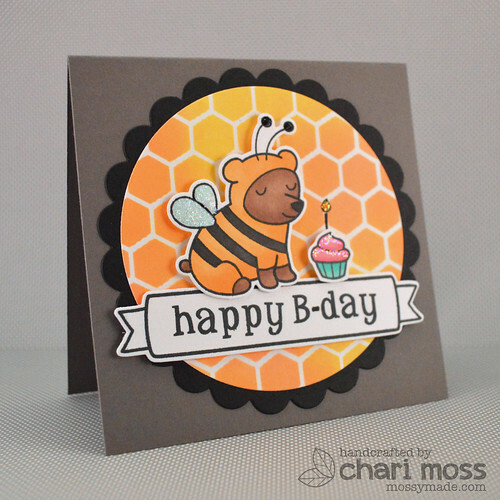 Today I have a card to share that I made after playing with the stencils. 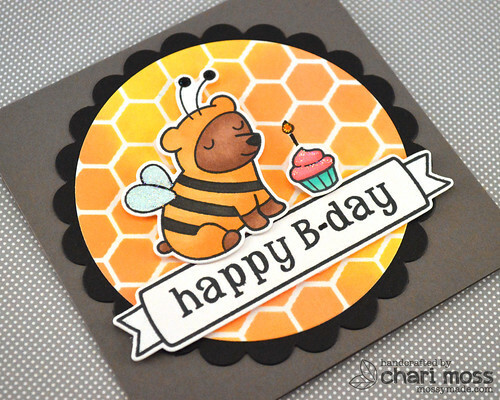 I used Tsukineko Radiant neon pigment ink in Electric Orange and Memento Luxe pigment ink in Dandelion over the Chicken Wire stencil to create a honeycomb background. I used the bear from Critters in Costume to go with my honeycomb background and created a custom sentiment with Riley's ABCs. I used circle and scalloped circle dies to cut the frame and the banner from Penelope's Blossoms is perfect for the sentiment. This is so pretty and adorable! Just love the glittery wings and cupcake! lol That little bear is so cute! The background is gorgeous! I am trying to learn how to create backgrounds so thank you for sharing!